Food Blogga: It's the Beautiful Bones Round-Up Part Two! It's the Beautiful Bones Round-Up Part Two! Tempeh is a mystery food to many people, but not to Arfi who learned the art of tempeh making from her late Indonesian grandmother (so you know you're in good hands with this recipe). 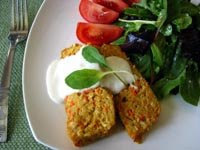 Make from fermented soy beans, tempeh is a chewy, nutty soy protein that is a hearty meat alternative for vegetarians. 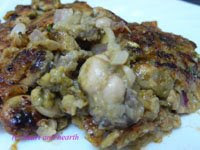 And like most foods, it's even better when fried in batter, so try Arfi's Tempe Goreng Tepung (Fried Tempeh in Batter). Prawns are sauteed in sizzling sesame oil until crisp then doused with rich soy sauce, sweet honey, and tangy lime. Simple, bold, and chic, that's Michelle's Pan-Fried Soy and Honey Prawns. Kalyn has a new friend in the kitchen-- tofu. Kalyn's foray into the world of tofu was so successful with her pleasingly spicy, ginger-y Stir-Fried Tofu Recipe with Scallions, Garlic, Ginger, and Soy Sauce, that she already has another block of tofu in the fridge. I have a feeling their friendship will be a lasting one. Have you heard about the crisis in Iverness, Scotland? There is a shortage of pasta machines there! That's right. How is a blogger to do her job when she can't buy a pasta machine? Well, she has to rely on ingeniousness. 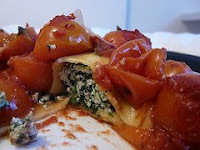 And that's just what Wendy did with her rich, satisfying Impromptu Cannelloni. Are you looking for an easy, crowed-pleasing, one-dish dinner to serves to guests? 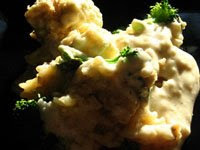 Then you must try Lisa's rich and creamy Brown Rice and Blue Cheese Gratin with Cauliflower and Broccoli. She has made it several times for guests, and each time, they have asked for seconds, so you know it's a winner. Think sardines can't look pretty? Think again. 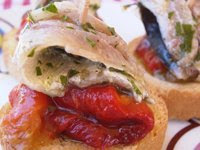 Nuria's Marinated Sardines (a.k.a. "poor man's sushi") are fresh, not canned. That means they are remarkably plump and glisten-y, and are exceptionally flavorful when marinated in Nuria's blend of fresh herbs, olive oil, and lemon. Lysy gets a gold star for creating a healthy, calcium-packed pizza. Yup, that's right, her delightfully named Spelty Shroomy Pizza is good for you. Made from the super grain spelt and topped with calcium rich goat cheese, rocket, and sunflower seeds, this is one pizza that will make both your belly and your bones happy. If you've ever eaten in an Indian restaurant, then you have most likely tasted Palak Paneer, a popular spinach and cheese dish. 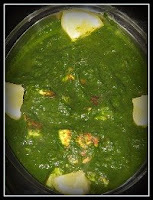 According to Ranjeetha, Palak Paneer is a Punjabi dish typcially eaten with Indian flat bread. Fortuatnely for us, Ranjeetha shares her recipe for homemade paneer cubes which will surely taste better than any restaurant's. Keep your man's belly happy and bones healthy with this calcium-packed Sicilian Sardine and Broccoli Rabe Pasta. Just one can of sardines provides an amazing 20% of your daily calcium needs! Everyone loves lasagne, right? Layers of fresh pasta, creamy cheeses, and tomato are perfection any way you slice it. Johanna has created her own slice of perfection but with a green twist: her Green Lasagne with Broccoli and Rocket Pesto takes traditional lasagne and makes it even better by adding calcium rich broccoli and rocket. From the home of the deep-dish pizza comes Stefany's unique Shrimp and Tofu Pizza. Crunchy panko-breaded shrimp top this healthy whole wheat pizza crust that is coasted with a sweet and creamy mango sauce. This pizza is definitely gourmet. Among super foods salmon reigns supreme. It's packed with Omega-3 fatty acids which do everything from increase your good cholesterol to make you smarter. Really. They're considered "brain food." (If only I knew that before taking my SATs). 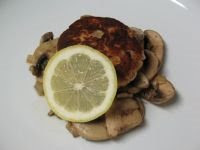 It's also super high in calcium, which is why Chris shares her recipe for these deliciously flavorful and crispy Salmon Burgers. In a word association game, it is likely that 9 out of 10 people would associate "oyster" with "aphrodisiac." Ning, however, knows that oysters are also powerhouses of calcium, and when combined with eggs in her Oyster Omelette, present one serious bone-building meal. Shibani takes great pleasure in cooking healthful dishes for herself and her family. So it's no wonder that she likes to cook with soy, which contains beneficial isoflavones that have been linked to a decreased risk in osteoporosis. You'll experience great pleasure too when you taste Shibani's Soya Kebabs seasoned with garam masala, ginger, and mint. The beauty of Zita's Prawns with Tomato, Garlic, and Cilantro is that it can be whipped up in minutes for a week-week dinner yet looks and tastes utterly sophisticated. Even the most tofu-averse person will gladly eat String Beans and Tofu with Thai Peanut Butter Sauce. Firm tofu and crisp string beans are smothered in a rich, creamy coconut milk and peanut butter sauce that is so good, you'll be tempted to eat it by the spoonful. Marie sounds like she's married to a typical Italian guy. He's not crazy about salmon but would always eat it whenever Marie cooked it. (Always a wise choice, guys). 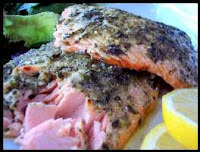 Ever since Marie created her Roasted Garlic Pesto Salmon, however, her husband actually asks her to make it. That's because Marie enhanced her traditional pesto with roasted garlic, creating a richer, smokier, flavor that is just irresistible on salmon. You just never know what foods will bring two people together. For Jeanne and her hubby, Nick, it was fish. Not just any fish. Kingklip-- a thick, white, flaky fish from South Africa. 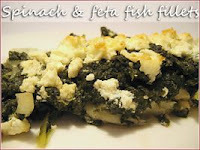 Jeanne used her kingklip to make Spinach and Feta Fish Fillets for a get-together where she was trying to impress Nick. I think it's safe to say it worked. 10 years later, and they're happily married. So skip the chocolate strawberries next time and go for the big fish if you want to hook a live one! It's grilling season, and in my book, that's cause for excitement. You're sure to get excited over DJM's Calcium Burger and Grilled Vegetables. Vegetables are transformed when they're grilled--they become caramelized, sweeter, crisper, and slightly smoky. They're the perfect companion for a calcium-rich soy burger smothered in creamy goat's cheese. What's better than creamy, rich, egg and cheese laden carbonara? 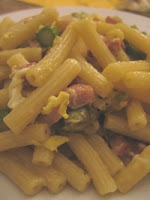 Rossella's Carbonara with Asparagus. She fries asparagus with the pancetta until it's crispy, then adds it to the pasta for an added dimension of flavor. This is the ideal spring time carbonara. Janet (Food Blogga's mom) says, "This Corn Sausage Casserole recipe comes from Louise Cola Giovanni. She and her husband used to rent an apartment in my mother's house when I was a little girl, so you know this is an old recipe! I'd say it's at least 60 years old. And I still love it after all these years. I don't have a recipe for it. I have made it so many times, I just know it by heart." 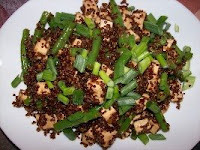 Amy's Stir-Fried Tofu and Green Beans with Quinoa is just my kind of dinner-- easy, delicious, and good-for-you. Made with sauteed tofu, green beans, and quinoa, this dish is loaded with bone-building calcium and protein. Unfortunately, Lynne knows the devastating effects of osteoporosis since her dad who has it recently broke his hip. (We're sending well wishes his way, Lynne.) So it's really important to Lynne to eat calcium and vitamin-D-rich foods like her Salmon Loaf. You'll love this recipe for it's nutritional value, quick preparation, and most especially, creamy, rich bechamel sauce that Lynne drizzles on top. Priya and her husband have started doing movie night dinner each week. They rent a movie and enjoy it with an easy-to prepare and delicious-to-eat dish like Priya's Crock-pot Enchilada Casserole. Since it's made in a crock-pot, you don't have to worry if you get caught in traffic on the commute home. Your dinner will be awaiting you when you walk through the front door. One of the best things Elizabeth ever did was subscribe to SAVEUR. 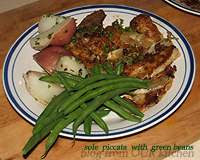 After making their recipe for Sole Picatta with Green Beans, she made it again two nights later. (Hey, when it's that good, who could blame her?) Plus, each serving of the dish has an amazing 20% of your daily calcium needs! Be sure to check out Elizabeth's post for much more important information about osteoporosis. Celia unfortunately knows the crippling effects of severe osteoporosis since several of her relatives suffer from it. Fortunately, she also knows how critical it is for her to take care of herself and eat well. It won't be difficult to do with her savory Family Style Bean Curd made with calcium-rich bean curd, chewy black Chinese mushrooms, and spicy oyster sauce. We all have people who have touched our lives in meaningful often profound ways. That special person in Susan's life was her voice coach Ruth, who suffered from severe osteoporosis. To Susan, Ruth "was like a treasured piece of delicate, antique porcelain - beautiful and translucent, and so very fragile." 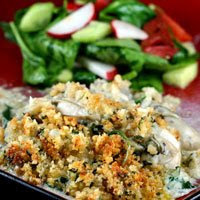 And for a beautiful recipe, try Susan's Oysters Rockefeller Gratin. Next time you feel like having pizza on a weeknight, save yourself the hassle and money of ordering out, and make Meghan's French Bread Pizza instead. 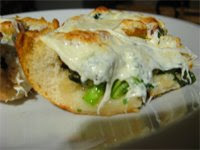 It's satisfyingly crunchy and is topped with healthy veggies and lots of bubbly, gooey mozzarella. So long, Papa John. Part of tofu's beauty is its versatility which Mimi really appreciates. Though she makes it many different ways, you'll really love her Golden Tofu Red Curry made with perfectly crisp, fresh, farmers' market sugar snap peas. Janet (Food Blogga's mom) has been making Grapenut Pudding for as long as she can remember. The recipe was her mother's (who is currently 99 years old!). Grapenut pudding is pure comfort food--thick, creamy custard is topped with a layer of crunchy Grapenuts cereal. Janet says, "Grapenut pudding was always my Susan's favorite, and I think of her every time I make it." Isn't my mom a sweetheart? Is there a more comforting dessert than rice pudding? One warm, creamy mouthful magically evokes feelings of nostalgia and warmth. So it's no wonder that Amy loves Rich Risotto Rice Pudding made with vanilla bean, cinnamon, and freshly grated nutmeg. Move over Chunky Monkey, Pedro Ximinez is in town. 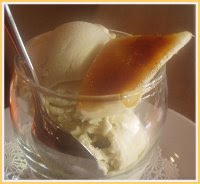 Cathy X has made ice cream from the deep, amber colored sherry, Pedro Ximinez. This luxurious ice cream is served alongside her Elegant Pistachio Cream Tart proving that dessert can be both nutritious and regal. 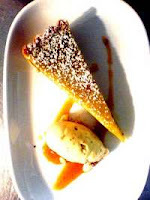 It's so wonderful when desserts like Lori Lynn's creamy, silky Bahn Flan are actually good for you. And make sure you check out her post to see how you can recycle your soda cans while making this! 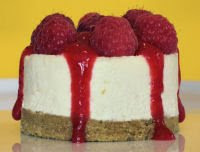 Other than perhaps ice cream, is there another dessert so universally loved than cheesecake? Dense, creamy Lemon Cheesecake is laced with Nicisme's homemade lemon curd and topped with perfectly plump fresh raspberries. Aaahhhh. Deeba has made her tropical homemade Mango Ice Cream twice already "to celebrate mango mania in the merry month of May." After one taste of this luscious ice cream studded with rich pistachios, you'll be making it 12 months of the year. Ayin shares a fantastically simple, fantastically delicious Caramel Pudding--vanilla laced pudding is drowned in caramel so sweet and sticky, you'll swoon. Just don't forget the cherry on top. Ben and Jerry's better watch out. Cherry Garcia has some serious competition from Elaine's perfectly pink Cherry Ice Cream. You'd better start stocking up on fresh cherries now to freeze for the winter, that way you can enjoy Elaine's ice cream all year round. Helen promises that her Mini Pana Cotta with Blackberry Coulis is "easy peasy." Since I trust everything Helen says about baking, I think it's safe to take her word for it. Helen infuses her basic creamy panna cotta with vibrant garden fresh mint, then tops it off with a tangy blackerry coulis made from freshly plucked, plump blackberries. Mary shares her recipe for clafouti-- the classic French custard-like baked dessert. Though clafoutis can be made with just about any fruit, Mary has chosen fresh sweet-tart raspberries for her Raspberry Clafouti. It's elegant enough for a tea party, yet simple enough for a quick week-night dessert. What's not to love about that? 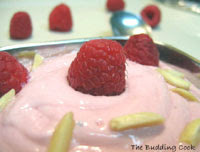 TBC shares an authentic Indian dessert with us--Raspberry Shrikhand. 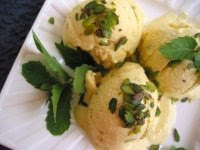 Shrikhand is made by straining yogurt until thick and smooth, then lacing it with sugar, cardamom and saffron. It was so delicious, that TBC is already planning on making it again with ripe, creamy mangos. Have you ever baked with kiwi fruit? If not, then you should start with Minko's Kiwi Cupcakes with Strawberry and Kiwi Cream Cheese Frosting. Each adorable cupcake is studded with little bits of juicy kiwi and sweet strawberries. And as for the fruity cream cheese frosting-- don't feel guilty for licking the bowl, it's high in calcium. When I was a little girl, there was nothing better than coming home after school to a bowl of my Mom's Chocolate Pudding with Bananas and Graham Crackers. It was cool, creamy, and satisfying, just what every overworked elementary school kid needs. 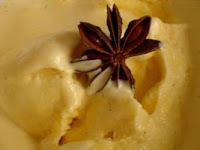 While visiting her friend, Marta, Simona spied a little bag of anice stellato (star anise) on her counter top and immediately decided to make Gelato All 'anice Stellato. If you like gelato, then you'll be smitten with Simona's luscious, custard-y gelato, subtly laced with anise and vanilla bean. Make sure you visit Simona's site for great tips on making gelato and to learn to pronounce "gelato" like you're from Italy. 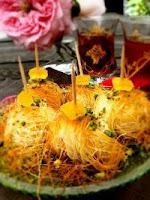 If you've ever eaten in a Middle Eastern restaurant, then you've likely had Knafeh Bil Jibne for dessert. I have, but to be honest, never knew what it was called or how to make it. Thanks to Marianna's beautifully photographed and detailed post, now I do. And so do you! So hop over to Marianna's to discover how to make this crunchy, creamy, golden, cheese pastry that is drizzled with rose water syrup and pistachios. Jyothsna shares her recipe for Mango Shrikhand which is made by straining yogurt until thick and smooth or by using labneh, a strained yogurt with a cheese-like consistency. Since it's mango season in the UAE, Jyothsna has added cool, creamy mango to her shrikhand and enjoys it for breakfast, dessert, and for an any-time treat. 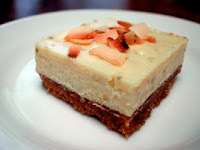 Annie says her Key Lime Bars "are low fat, but you'd never know it." Just one look at that ultra-creamy bar is proof enough for me. By mixing low-fat cream cheese and fat-free sweetened condensed milk, Annie was able to keep the flavor and lose the fat. And with tangy key lime and toasty coconut, this bar just gets better and better. You will cry with joy when you taste Brittany's seriously custard-y, rich Roasted Banana Ice Cream. Bananas are macerated in rum, lemon juice, and sugar and roasted to draw out their natural sweetness. Then they're adding to her satisfyingly thick and creamy ice cream. Brittany says this may be her finest ice cream achievement to date. No argument here. 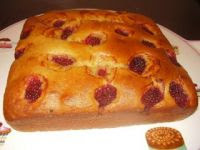 With berry season upon us, it's time to bake some summer-y treats like Cakelaw's Blackberry Almond Yoghurt Cake. This ultra moist cake made from creamy yogurt and nutty almond meal is studded with brilliant purple sweet-tart blackberries. Don't limit it to dessert though; it's great for breakfast or a mid-day treat too. Can cookies be good for your bones? 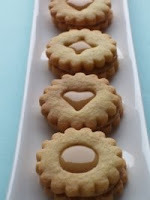 They can if they're Linda's beautiful Hazelnut Cookies Sandwiched with Dulce de Leche since both hazelnuts and sweetened condensed milk are powerhouses of calcium. So eat 'em up! Your bones (and your belly) will love you for it. When the weather turns sultry, do like JZ, and make a batch of chilly, homemade Cheesecake Ice Cream. This is one luxurious ice cream--silky, creamy, and tantalizingly sweet. I feel cooler already. Stef shares her Tres Leches Cupcakes made with not one, not two, but three types of calcium-rich milk. That means they're three times as delicious too. Seriously, we're talking about someone whose blog is called "Cupcake Project." I think we're in good hands with this recipe. Marta shares her Carrot and Star Anise Pudding, a unique version of a traditional pudding recipe called Bunet. The original is made from chocolate, coffee and amaretti cookies, but Marta's is lighter and healthier with freshly grated carrots and star anise-infused milk. Like many of us, Medena starts her day with a cup of coffee. Unlike many of us, she makes one glamorous cup a joe. 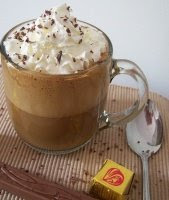 Her Nescafe Late is a wake-you-up-in-a-hurry blend of strong coffee, milk, and whipped topping. The chocolate shavings are "optional." Yeah, optional. Need a little motivation to get to the gym? How about knowing you'll enjoy this dreamy Creamsicle Smoothie when you're finished? Hey, it works for me. What do you do with overripe bananas (besides making banana bread)? Nangil Girl makes a deliciously creamy and healthy Mango and Banana Smoothie. Made with both milk and yogurt, this is one powerful bone-building libation. If you're like BalBanu, then you need your morning cup (or cups) of tea. 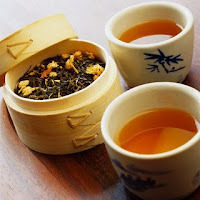 Her green tea is highly beneficial: it contains antioxidants that may lower your risk of cancer and cardiovascular disease, and it contains flavonoids that may help build bones and make your teeth stronger. So drink up! What do you do when your wee one isn't feeling well and has trouble eating? You make her a nutritious, delicious, and easy-to-swallow Warm Mango-Raspberry Oatmeal Smoothie. Of course, this smoothie is so good, that you'll keep making it well after your little one has recovered. I don't know how you spent your Memorial Day Weekend, but mine was pretty boring compared to Christie's. She had a blast drinking Black Cows (root beer floats) at the World's Largest Brat Fest in Madison. ("Brat" is short for bratwurst.) Despite being a chilly 49 degrees that morning, the festival was a sure sign of summer's arrival in Wisconsin. And that's something to drink to. What a terrific roundup! I am in total awe that you got it up so fast! There are so many fab recipes, I don't know which to try first. Thanks for hosting such a delicious and educational event, Susan. I know that I learned a lot from it. Three cheers for this superb, bone-building post! Thank you for corralling such a terrific collection of recipes. Yumm, yumm, yumm. I love going through all of the dishes. There's quite I few that I have already tried this month. In fact, I have Deeba's Mango ice cream in my freezer right now.... Which reminds me that I need my calcium for the day! Ice cream makes a good breakfast too, right? WOW! What a turnout and round up! This is a cookbook. Now I have to leisurly go back and check out these great submissions. Great roundup and your pasta looks great too. What a spread! One can make meals for a year with all these recipes. Great roundup, Susan, for a great event. Geez! I can't believe how many recipes you have on here! You really did have a great turn out. Makes me wish I would have submitted something! Thanks for having such a useful blog event! Lets have another soon. What a great round up! Awesome bone loving entries! wow what a great collection of calcium-rich recipes! I really enjoyed participating and now am enjoying discovering plenty of other great recipes! Thanks for your time on this very worthwhile event Susan! Awesome roundup, Susan! Thanks for hosting such a great event. thak you, susan. this round-up is of great use to me, personally. it was a stupendous effort on your part. And now we have this fabulous collection of recipes in one spot! Thanks for hosting, Susan. Bravo, Susan!! Great recipes, great turnout and great job, as usual. What an unbelievable post?! The biggest I have ever seen on any site! Great selection, nice one, I'm going to have to think about what my fave is now?!?! Oh my goodness Susan - you have outdone yourself! What an amazing roundup of fantastic and bone-building dishes! I am definitely going to work my way through them. Wow Susan, what an amazing collection! Thanks for raising our awareness and thanks for including me! Fabulous _ I can go to someone else's house for dinner and dessert to get my calcium rich fix every day. marianna-And thank you for participating! tbc-It's a great resource, indeed. lori lynn-Thanks for participating! I really enjoyed it.